The RP 340 is the latest standard sized pistol-grip tool in the industry leading RIDGID Press Tool family. 30% smaller and 17% lighter than its predecessor (RP 330-B), this tool is ideal for making any connection on the job. 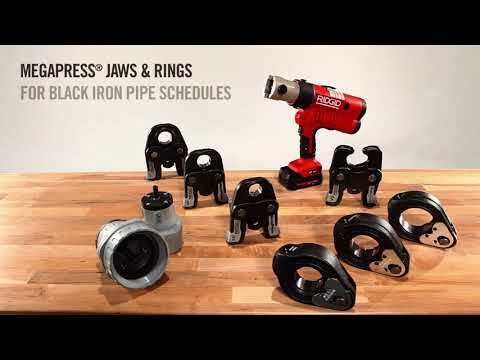 Also, the RIDGID RP 340 is the only standard sized tool that offers a full line of jaws and rings compatible with: ½ - 4” ProPress for cu & ss, ½” – 2” PureFlow for PEX, and ½” – 2” MegaPress for steel. The RP 340 truly is built to impress. More than 400 presses per charge using Advanced Lithium 4 Battery. Ultimate flexibility with the ability to switch between battery and AC power on the same tool. LED-light for continued operations in no or low-light environments. **AC battery adaptor is not available in Australia. Capacity ½" to 4" for Copper and Stainless Steel, ½" to 2" for PEX. Head Rotation 180˚ barrel/jaw swivel. Hydraulic Ram Output 7,200 lbs. (32kN). Weight 8.3 lbs./3.76 kg with Advanced Lithium 2 battery, 9.5 lbs./4.3 kg with AC power adapter. Operating Temperature Range 15˚F to 122˚F (-10˚C to 50˚C). Approximate Cycle Time 4-5 seconds. Longest Service Interval in the Industry 42,000 cycles. Compatibility Uses RIDGID Standard Series pressing jaws and attachments. For use with copper and stainless steel tubing, steel pipe, PEX and cutting soil pipe. For Australian Pressing Customers: Contact us for compatible fitting systems and jaw sizes. RP 340 Press Tool is rated 4.9 out of 5 by 52. Rated 4 out of 5 by Anonymous from This product is better then the other brands. It is a great product , but I think for the cost of the fittings the tool could be a little more affordable. Rated 5 out of 5 by Jairo from One of the best investment that our company has made. This tool has made save us so much time. Our job looks more professional. In the next few months were thinking of investment in tools. Thank you. Rated 5 out of 5 by Plumboy from The tool is light and works so smooth. The press tool is light easy to use when I used it the pipe had water dripping from it everything went together with no problem I like the way you can menuaver the heads with ease would definitely recommend this tool mines go 1/2 to 2 inch love it. Rated 5 out of 5 by Perrytheplumber4 from Best Product on the market! Fantastic tool. I have been using Ridgid press tools since January 2016.The 200 B, and the new 241 are also great tools. It’s unbelievable this Rigid 340 can press up to 4”. It’s small and relatively light given all it can do. The C-1 Kit is also the best investment I have made. It gets you into all the tight spots when using the 241 tool and the older 200-B tool. Press is the only way to go. 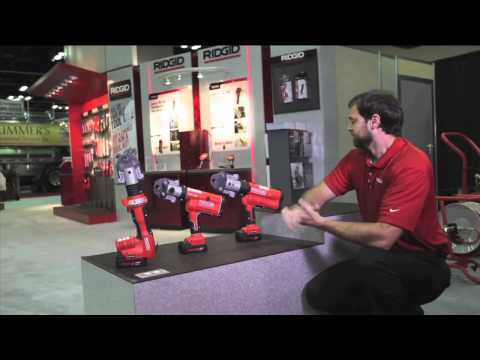 And Ridgid makes the best press tools on the market. I have tried other brands, and it’s not even close. Rated 5 out of 5 by Littleezee28 from This product works great I love the purchase of this product .Easy to use and works great. Saves time on the job. Rated 5 out of 5 by baldwinheating from makes my jobs so much easier this tool is one of my most valued tools on the truck. It makes jobs go much faster and look nice with no solder showing or heat marks. Rated 5 out of 5 by patg717 from This product is SUPERB! Can't beat it. I have been using Ridgid products for over 30 years as a plumber. This product has made my life so much easier. I can get this tool into tight places and have a very secure feeling with it's performance. Once again Ridgid has secured my confidence in the use of all of their products. I thank Ridgid for keeping the plumbing trade innovative. Can you use this this tool for brass to copper on condensers and evaporator?